Barry Beach And The Aftermath Of NBC Dateline: Return To Poplar River. 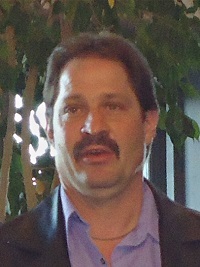 Barry Beach is shown here speaking at a Montana Innocence Project event. The NBC Dateline Show: Return To Poplar River aired on Friday night, August 2, 2013. On Monday, August 4, 2013 his Facebook page, with supporters as the administrators, was completely shut down. According to some sources, they were told that the Montana State Prison and the Montana Attorney General’s Office had it closed. Don’t they realize how much momentum this cause has gained? People from all over the country believe in his innocence and believe that he should be given a fair trial. This is only one step more in showing how corrupt the system in Montana is! Story after story showing where the AG’s office has not followed up on other crimes within their state departments, and the regular people of Montana get the shaft! Barry Beach’s case has seen many twists and turns over the years as he’s tried to prove his innocence, but none so dramatic as what happened May 14, 2013. After living for 18 months as a productive, hard-working citizen free for the first time in nearly 30 years, Beach’s innocence petition was dismissed by a divided Montana Supreme Court that reinstated his 100-year, no-parole sentence. This surprise decision overruled a District Court Judge who in 2011 ordered a new trial for Beach after being persuaded by powerful new evidence – including a credible eyewitness to the murder – that Beach was not responsible for the 1979 murder of Kimberly Nees. Right now the petition for Barry Beach is well over 13,000 signatures. America is not backing down. Did you miss Friday’s Dateline NBC update on the story of Barry Beach?